Cozy corner breakfast nooks, colorful built-in booths, sophisticated banquettes, wide-open spaces and gilded formal rooms all made the most popular dining spaces list for 2017. 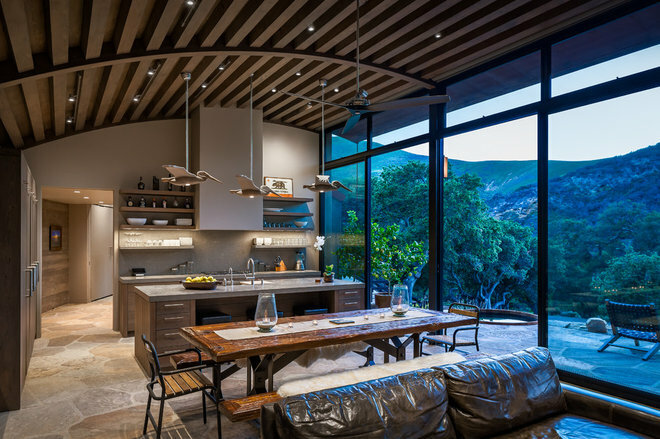 These photos, uploaded this year, have been ranked by how many Houzz users added them to their ideabooks. There was a wide variety from casual to formal, with eat-in kitchens and open plans making a strong showing this year. But don’t write off the traditional formal dining room just yet. Here they are, counting down from No. 10 to the most popular. This home is nestled in a Santa Barbara canyon overlooking the Santa Ynez Mountains. The homeowners wanted to use materials that meant something and tied the design to the region. One of the homeowners designed the dining table. Its top is made of reclaimed wood salvaged from the beach when the nearby Gaviota Pier was destroyed in a winter swell, and its steel base was inspired by the steel railroad trestles along the Gaviota Coast. Local craftspeople built the table: Neil Crancer of RHC Construction made the top, and Jeff Mielcarek of Artistic Wrought Iron made the base. The unique pelican lights honor local wildlife and were created by local artisan Danny Smith of Wood Reflections. Takeaway: Take the time to find local talent when looking to add special touches to your home. It will forge connections between your furniture and artwork and the place where you live. 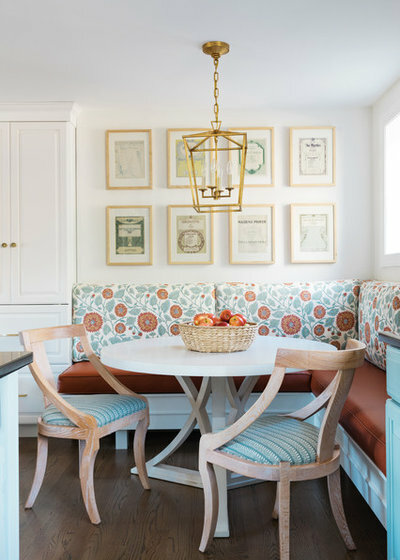 This once-unused corner became a favorite spot in the house, thanks to this cheery banquette. Its style is India Meets New England — the colors and patterns were inspired by India, where the homeowners grew up, and the overall style (layout, lantern, traditional gallery wall) references its Massachusetts locale. Takeaway: Bright colors and good lighting in the kitchen truly can help you wake up and start your day right. Most of us were drooling over this incredible seaside view, and that’s thanks to the thoughtful light hand that decorated the room. 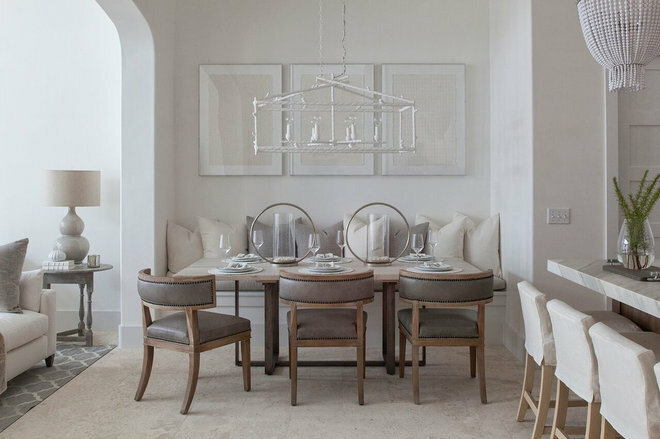 Crisp white, driftwood-like wood tones and a rug that looks like it could have been woven from the dune grasses outside complement the view and keep a clean coastal palette, while iconic Danish Wishbone chairs and Finnish pendant lights show architectural appreciation. Takeaway: When you have a fantastic view, be careful to enhance it rather than compete with it. 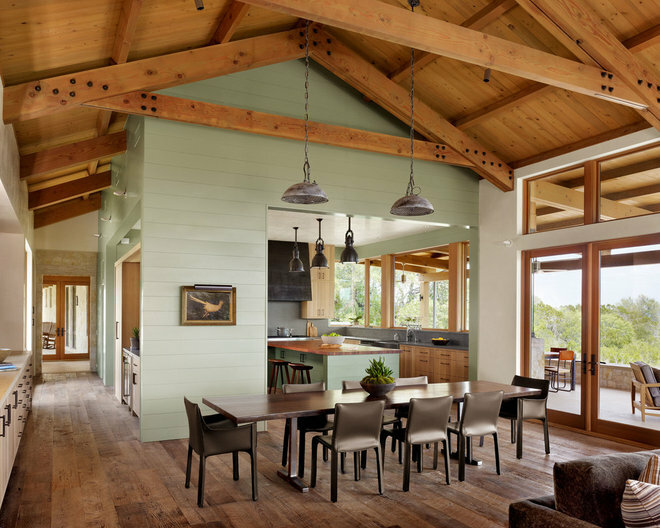 Located in the Hill Country outside Austin, Texas, this open dining space nods to local ranch vernacular. The ceiling and lighting recall a barn, while the kitchen is set up to look like a building within a building. Look at the backside of the kitchen — it’s a well-placed, built-in wet bar. The long rectangular table stands up to the scale of the log rectangular house. Takeaway: Whether you’re placing a built-in home bar or rolling a bar cart, a spot somewhere between the kitchen and dining table is often a good one. Two creative pals and business partners decorated their home in an artsy neighborhood in East Nashville, Tennessee. Their cozy booth is a favorite spot for not only eating but also visiting and hunkering down to get some work done. Takeaway: Look in your fruit basket for color inspiration, like they did with this lemon yellow door. With today’s open plans, it can be hard to delineate a dining space. But the way this area tucks in an alcove between the kitchen and living room has a lovely intimate feel. Takeaway: Bring a soaring ceiling down to human scale with elements like artwork and light fixtures. Round dining tables are more casual and conversation-encouraging than rectangular ones. The placement of this dining space makes it versatile. It can serve as catch-as-catch-can breakfast nook and, with some changes to the lighting scheme, a formal dinner spot. Takeaway: Upholstered chairs keep diners comfortable and able to sit and chat for hours. Oh, I know you traditional formal dining room lovers were probably starting to wane as you scrolled down this list, not seeing anything but casual spaces, open floor plans and modern and transitional furnishings. But perk up — there are many trad lovers here at Houzz, and the third-most popular dining room proves it. The crystal chandelier, gilded mirror, classic furniture, elegant rug and beautiful millwork all give a toast to tradition. At the same time, creative moves like the chocolate wall, wallpapered ceiling and oversize ginger jar mean this room’s style is anything but stuffy. Takeaway: Don’t miss a design opportunity on what designers refer to as “the fifth wall,” the ceiling. 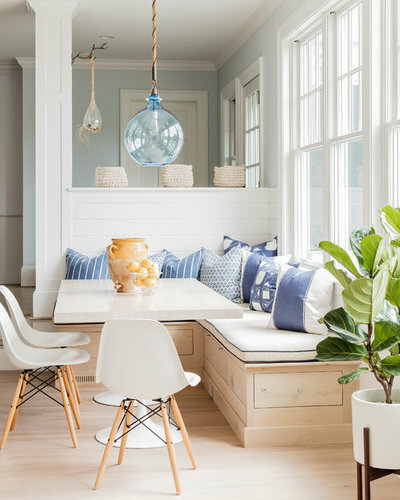 In Manchester-by-the-Sea, Massachusetts, this kitchen’s corner banquette has nautical style that doesn’t go overboard. Light oak wood, blue-and-white patterned pillows and a glass pendant light feel seaworthy but balanced thanks to classic midcentury modern Eames shell chairs and tulip bases for the table. Takeaway: If you want a subtle coastal look, leave the shells, crabs and anchors in the sea and use color and texture instead. I don’t know about you, but as I got to know this list I felt sure the No. 1 dining space would be a cozy breakfast nook or inviting kitchen booth. But, no, formal dining still rules. 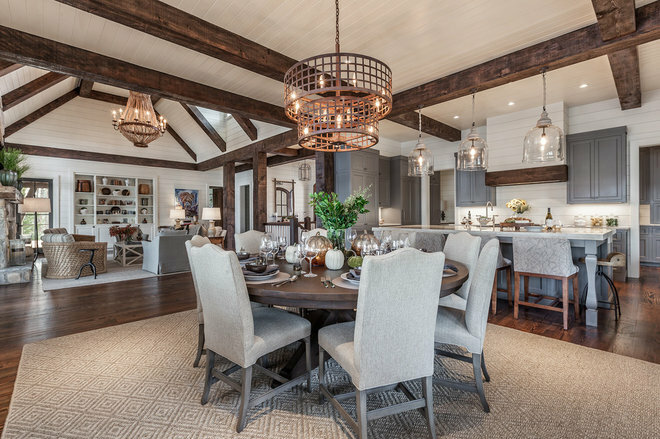 This room is part of a Houzz Tour that was a hit with readers in 2017 — one with transitional farmhouse style, smartly designed based on Not-So-Big-House principles. 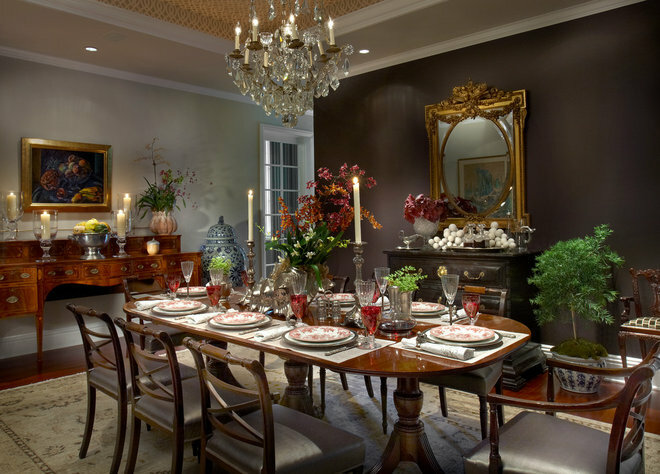 While this is a separate formal dining room, it has cozy proportions and casual touches. For instance, all of those windows make it feel like a sun porch. 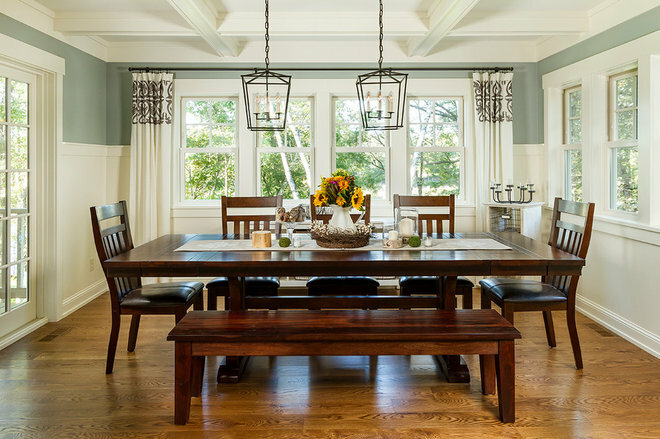 The mix of seats and a bench keeps things family-friendly for little ones to eat in here, and the table and lanterns bring in farmhouse style. There’s direct access off this room to the home’s wraparound porch. Meanwhile, the coffered ceiling, substantial wainscoting and drapes lend traditional dining room formality. Takeaway: You really can’t go wrong with a coffered ceiling in the dining room.